Experimental and improvised music festival Audible Edge has retained much of its rough-and-ready community origins, whilst growing in scale and significance. Audible Edge is now in its third year. It was mounted by rising grassroots music organisation Tone List, with Tura New Music and the Perth Institute of Contemporary Arts (PICA). The 2019 festival featured three concerts: the first a tight affair at PICA, and the later two more sprawling events in Fremantle and which included a triple album launch from locals Shoshana Rosenberg, trio Original Past Life, and the Moon Project. Audible Edge shares several artists with Canberra’s Sound Out and Sydney’s NOW now festivals. Like both organisations, free improvisation dominates the program, although other approaches do appear. This does however make the festival feel a bit random. While the tremendous electroacoustic set from Canada’s France Jobin for example was a standout, her precisely monitored, immersive aesthetic sits at considerable remove from the freewheeling in-the-moment experimentation of Sydney’s extended brass player Jim Denley. This diversity is bracing but also at times confusing, and it was only on listening back to Jobin’s record Singulum that it became clear that her set and those of several others were less improvisations, but closer to live performances of through-composed pieces, as was also the case on the final night. In the realm of electronic compositions, Jobin’s trajectory from almost Fennesz-esque, glitchy drones, through to a rich analogue-like sound akin to that of Klaus Schulze and other pioneers was striking. Also impressive was the teaming of Perth’s Ryan Burge with German drummer Christian Marien. Burge sampled Marien’s initially quite minimal paradiddles and runs, as well as the sound of the room of itself, before Burge played this back in a distorted fashion, intermittently adding new samples of various objects and instruments. This gave the performance a very dub feel (the work of 310 comes to mind), as a live exploration of various spatially shaped and housed noises, which coalesced around us as Marien moved through various fairly consistent grooves in which he explored particular parts of his kit, sticks and percussion items. Also impressive was Original Past Life’s very “krautrock”/kosmische-musik influenced set. In their frequent breakdown into grinding electronic noise, OPL closely recalled the live sets of noise-rock legends The Dead C.
Sitting between electronic processing and acoustic improvisation was Sydney clarinettist Laura Altman, who records her wistful, lightly muted sounds on small microphones placed beneath cans and other resonant objects, signal from which is then fed into cassette tapes whose playback is picked up again. Lovingly manipulating these devices with her feet while cupping her clarinet’s mouth against her thigh, this was a wonderfully corporeal work of gentle feedback, metallic buzzes and stop-start, warbling, acoustic noises. 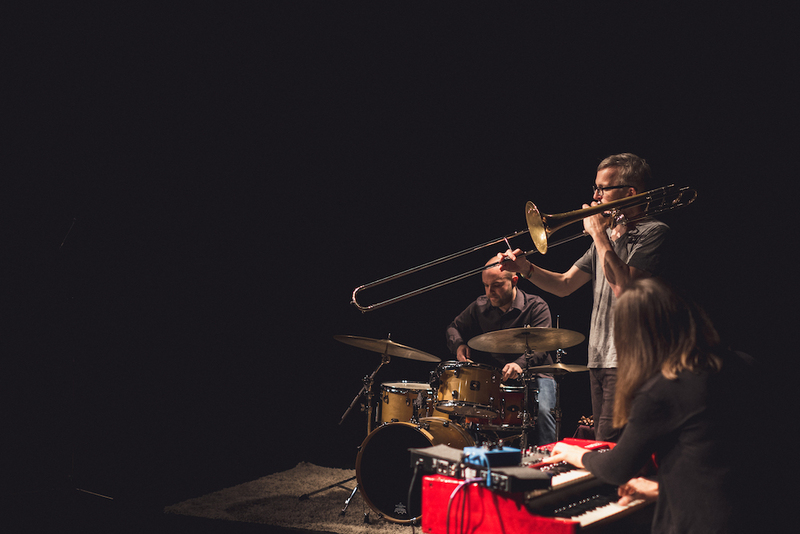 Among the internationals, Christian Marien’s long-term collaboration with trombonist Matthias Müller as Superimpose provided a lesson in just how interlocking an improvised duet can be. Marien rubbed styrofoam across his snare drum to produce a sound remarkably close to Müller’s brassy yet crinkling, bubbling and sucking noises, which the trombonist added to by placing a plastic cup in the trombone’s mouth. The pair fell into quite a compelling groove before winding up. Denley appeared as part of several configurations, including an avant-improvisation super-group of four which featured a dancer. But his stand out contribution was as half of Plant, with Canadian extended bass player Éric Normand. The latter has a set up similar to Altman’s, in which sound is played back via a small, movable microphone which vibrates the guitar’s strings. He often dropped this microphone into cans or other items resting horizontally on his guitar, before producing a raging, distorted series of squeaky knocks by agitating the bass with a stick of wood. Denley by contrast, uses a Pringles can as a mute, whilst also drumming and banging the can acoustically. Denley is an expert at producing saxophone noises without using the reed – he affixed a balloon to his mouthpiece so as to author a series of elegant raspberry variations – but he now occasionally uses his instruments with those reeds actually designed for them, a welcome change from his almost too extended playing of some years ago. Plant’s contribution overall was a joyously mad affair, ending with Normand shaping the sounds from his miniature speaker by putting it in his mouth, a possible homage to Laurie Anderson’s Small Voice (for Speaker-in-Mouth). Though a change of pace, Shoshana Rosenberg’s droney, circular-breathing clarinet solo from Overlapping Magisteria was both meditative and almost neo-Romantic in its focus on a simple rise and fall of laddered, harmonic notes. The Moon Project later played a scrolling graphic score. Here, the constantly fluttering and leaping exclamations of Kirsten Smith’s flute were balanced by Catherine Ashley alternating between harsh atonal plucking, versus mellifluous harp flourishes. Even if this closing selection did not resonate particularly with previous nights, it was great to round off with new material from Perth artists. One must conclude then that Audible Edge has retained much of its rough-and-ready community origins, whilst growing in scale and significance. From gorgeously ornate audiovisual storytelling, to endlessly inventive rough theatre. The cutting-edge US artist will discuss composing in a post-truth world and perform her work inspired by a military “blood chit”. Intercurrent demonstrates a contemporary music scene alive, evolving and thriving. The work in progress showing of Cat Hope's new experimental sound opera left one writer virtually speechless. Promising a deeply unsettling theatrical experience, The Irresistible takes us into the subconscious. Decibel new music ensemble’s Artistic Director gives insight into an electro-acoustic-inspired programme.